Ah what a summer this is turning out to be. The weather is warming up, and the festival season is in full swing. Not only that, but the World Cup has lit up Chicago like I’ve never seen before as futbol fever is sweeping over the city. I’ve got a fever myself for not only the beautiful game but wonderful food. Sorry, no cowbell here. 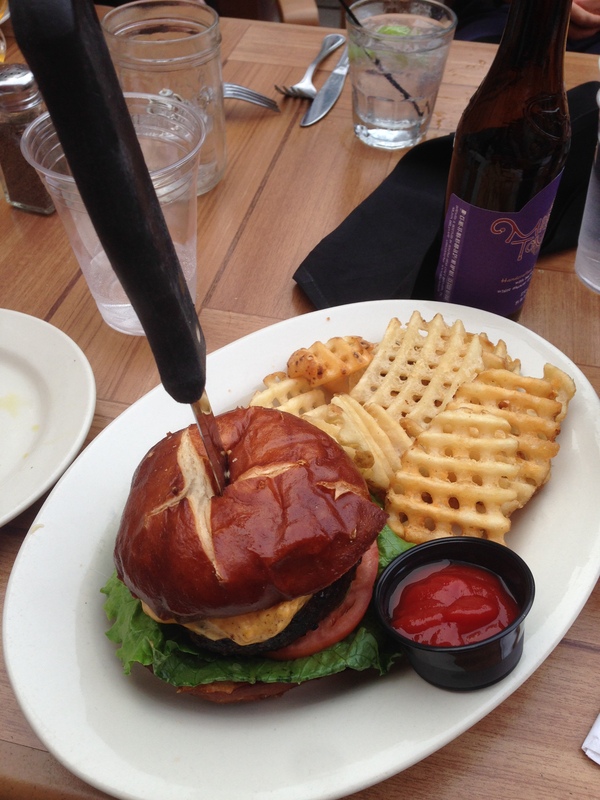 Today’s post on Mastication Monologues takes us to George Street Pub in Lakeview. The exterior of the bar was quite average looking as it blended into the genteel surroundings common to the northside. Upon stepping into the establishment, it was designed like any other sports bar sans memorabilia on the wall: exposed brick, plenty of tvs showing World Cup matches and baseball games, leather booths, and dark wood furniture. There is indoor and outdoor seating, and we opted for the latter option. That proved to be our downfall as the temperature dropped it like it was hot as a chilly wind descended upon us on the exposed patio. They had a few heat lamps but way too few to warm up such a large space. Unless, it’s perfect weather out there, I’d recommend sitting inside. 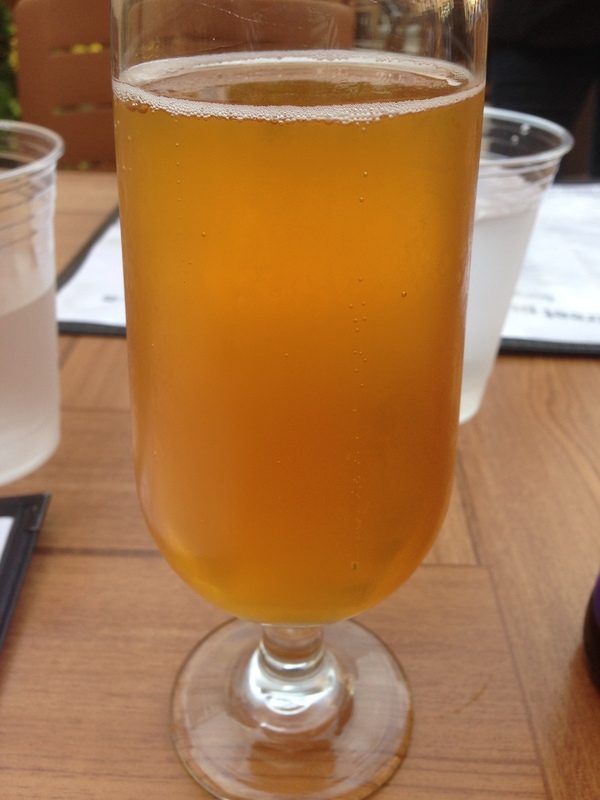 Upon sitting down, we ordered some drinks, and I picked a Midas Touch Golden Elixir beer ($6). I picked it since it was described as “spiced” on the menu which naturally piqued my interest as it was nestled among the porters, IPAs, and lagers. After doing a bit of research, this “beer” is somewhat between wine and mead as it is derived from residue found in clay vessels from 8th Century B.C. in the tomb of the legendary King Midas. At the time I didn’t know this, but now I know that I sampled the beer of the king who turned everything he touched into gold made me feel like I was getting a bargain. Once it came out, I was greatly intrigued to see what I actually looked like, and it was imbued with a rich, golden hue. It wasn’t carbonated, and the taste was unlike anything I’ve ever had. It had a sweet aroma due to the honey and a slightly herbal scent compliments of the extravagant saffron. The beer was light and clean with dulcet tones of the muscat grapes that were tempered with the spices. I’d highly recommend it, and the bartender there said it was his favorite beer out of the hundreds on the beer menu. I now know why the Midas Touch was a hidden gem. Since Janice and I were a pair of Hungry Hungry Hippos, we decided to get some of the chicken wings ($7) while waiting for her friends to finally arrive. 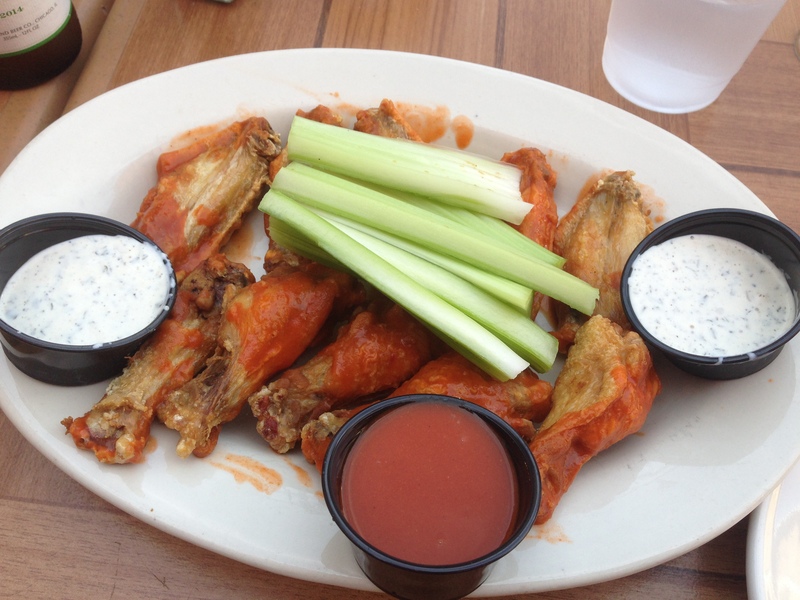 Diners have the option of mild, medium, or hot wings along with ranch and blue cheese for dipping. We got mild ones with extra hot sauce and blue cheese on the side. The different levels of spice depends only on how much of the sauce they put on the chicken pieces. They came out, and they looked a bit underwhelming. While we got plenty for the price, they were on the smaller end with semi-adequate amounts of meat on the bone. I really liked the buffalo-style sauce on the skin that had a real hot punch that jived with the reinvented blue cheese sauce that had oregano and garlic in it. 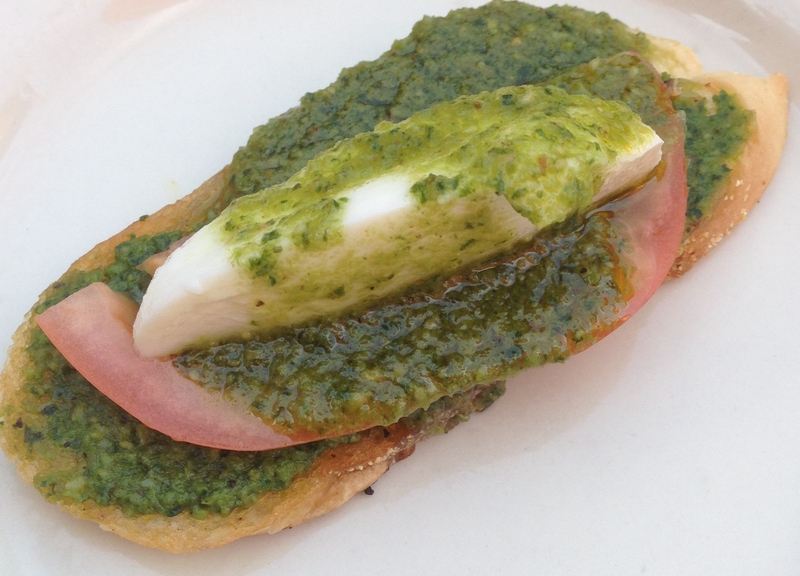 Eventually, her friends arrived, and they picked the pesto bruschetta ($6.95). When it came out, it would have made nonna say “Mama mia!”. It was a much more simplified yet modified version on this Italian antipasto. While the crispy bread was surprisingly warm and semi-soft, it was rubbed with a little bit of garlic and pesto. The toppings were a departure from the typical minced tomato and basil mix, and instead it was like a caprese salad fusion complete with a slice of buffalo mozzarella and tomato. It was a refreshing remix covered with a hefty helping of creamy and rich pesto. I’d recommend this appetizer over the chicken wings. 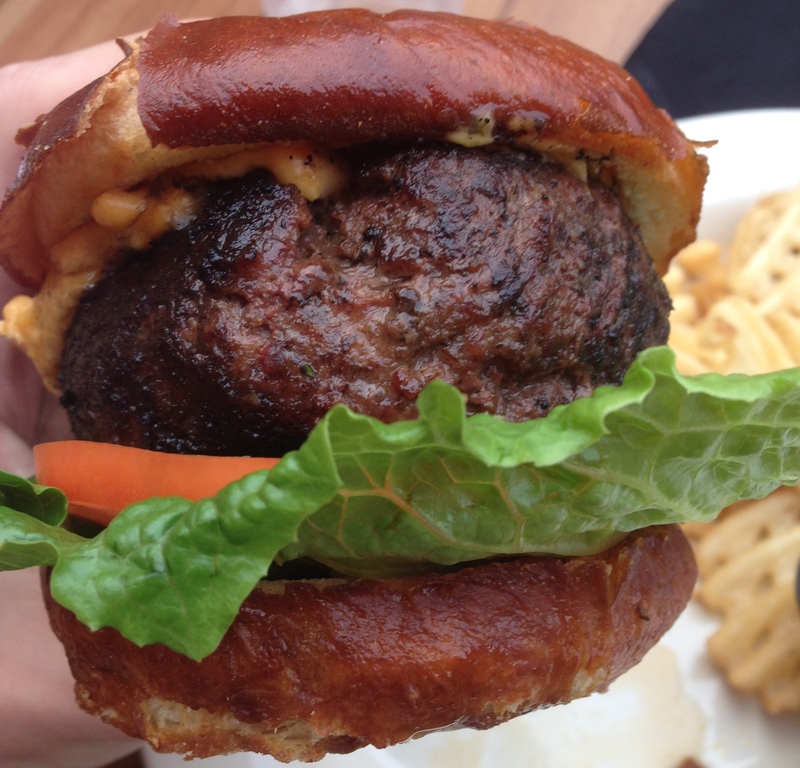 When it came time to order, I got the George Street Pub burger ($10) along with a Smuttynose Robust Porter. They both came out at the same time, and both complimented each other perfectly. The Smuttynose doesn’t get it’s name from that creepy guy snooping around the dirty magazine section in the supermarket but rather the name of an island off the coast of Maine and New Hampshire. It was a smooth pour and taste with hints of chocolate and coffee that brought big flavors to match the gargantuan burger in front of me. 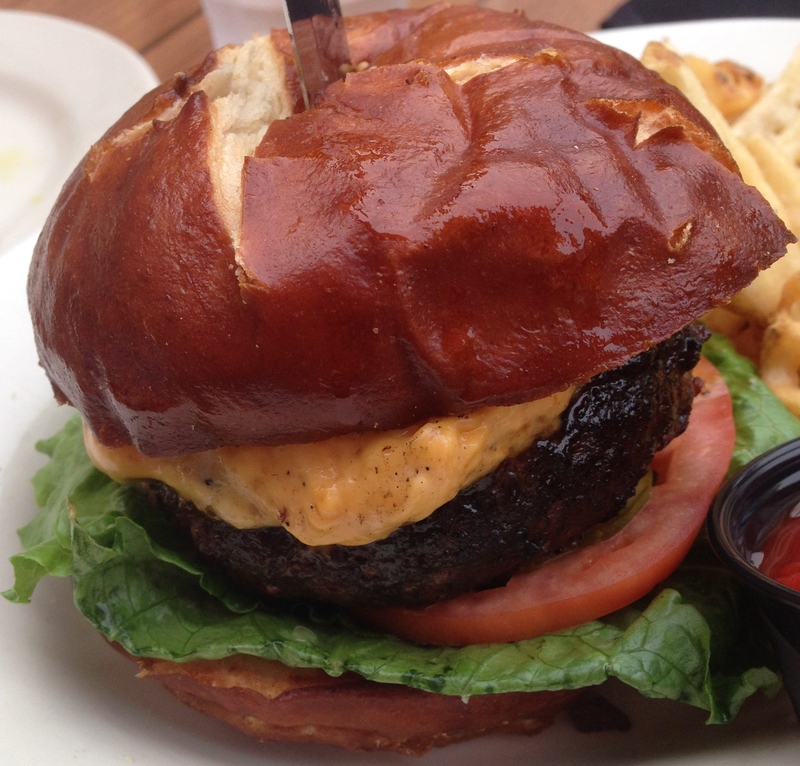 The George Street Pub burger was a half pound patty sandwiched between two pretzel bun halves and topped with a thick slab of smoked cheddar. 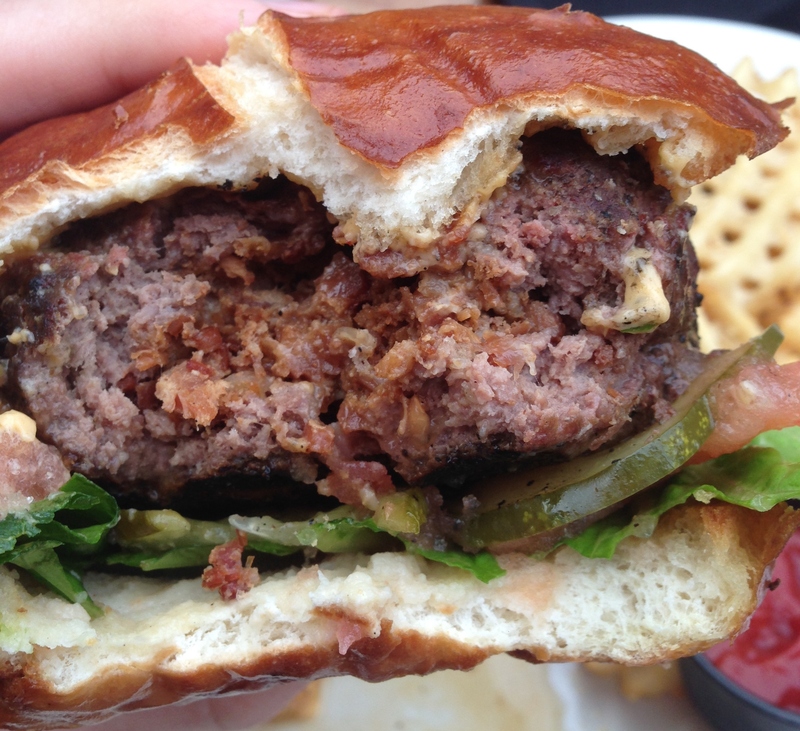 When I bit into the sandwich of kings, I was greeted with a patty bursting with flavor and bacon bits, caramelized onion, and chorizo within the bulging beef cocoon. It was a ton of meat spiced up with the mish-mash of chorizo and the pungent onions. By the time I finished the burger, I thought I wouldn’t be able to pass one waffle fry past my lips, but I was wrong. These bad boys were delicious, but unfortunately I couldn’t enjoy all of them due to my struggling stomach. Overall, George Street Pub is like many gastropubs that can be found around the Chicagoland area, but I’d recommend it if you’re just looking for a relaxed place to catch a game or stuff yourself silly with good food and great beers. 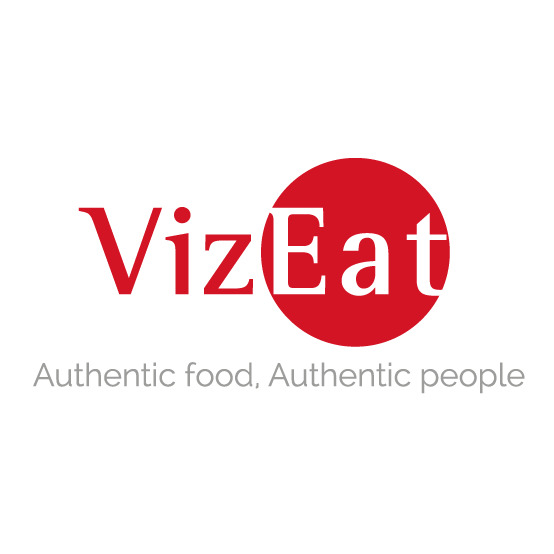 Posted in Alcoholic, American, American Cuisine, Barbecue, Beer, Beverages, Burgers, Chicken Wings, Comfort Food and tagged Bar, Beer, bruschetta, Burger, cheese, chorizo, gold, history, King Midas, onions, pesto, Porter, Pub, tomatoes, wings. Bookmark the permalink.